Managing relationships is a necessary and vital skill in business. The ability to work well with people of different backgrounds and personalities, with diverse strengths and weaknesses, can make work both intellectually complex and emotionally challenging. Since people aren't clones and don’t roll off assembly lines, no one person is exactly the same as the next, which makes the ability to adapt to different types of people and work well in a team environment one of the most highly valued and in-demand business skills. [a term that has come to replace "people skills” and “soft skills"] most businesspeople would now acknowledge that knowing how to deal with others effectively is the elusive x-factor that can make or break a career. This notion is perhaps best captured by the popular corporate maxim, “IQ gets you hired; EQ gets you promoted." The hardest competencies to master in business (and life) include things like communication, empathy, influence, trust, teamwork and leadership. In other words, working well with others. A big part of what makes this challenge so complex is that everyone has different beliefs, values, motivations, task preferences and wide-ranging views about how work should be done. Personality conflicts are a common part of group dynamics that can interfere with productivity, which are often preventable when people have a better understanding of what makes their colleagues tick. All people — regardless of age, race, culture or gender — share similar behavioural characteristics. One person you meet might be talkative, sociable and loud, whilst the next might be quiet, shy and methodical. Some people like structure and some don’t. Some like to move at a fast pace; others prefer to take their time. These sorts of behavioural quirks can make “clicking" with someone similar to you feel like a breeze, but for those who are not, it can make life tricky, challenging, and even exhausting at times — particularly if you are trapped in an enclosed office space with them for 8 hours a day! 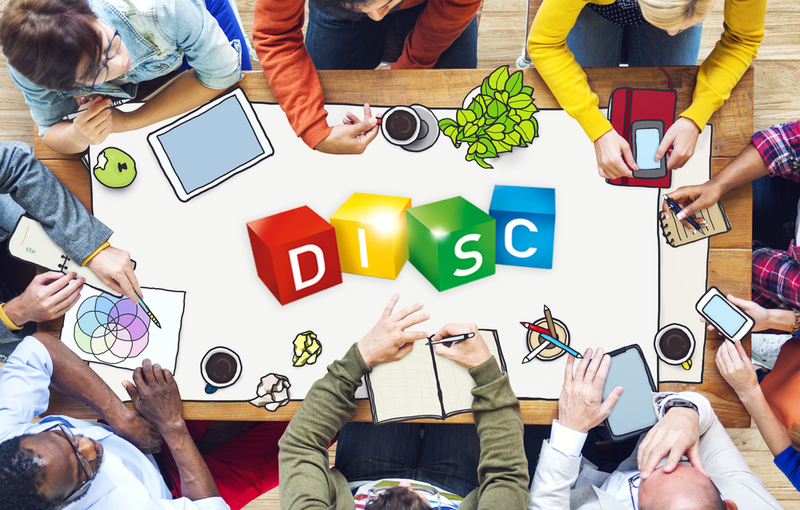 DISC is the world's best known behavioural assessment and one of the most popular team building tools, taken by millions of people every year and estimated to be in use by 75% of Fortune 500 companies. The DISC model is a very simple and fun (yet rigorously validated) four-quadrant framework that measures observable human behaviour. Specifically, it identifies the four most common groupings of behavioural tendencies found in people all over the world. - Dominance: tends to be direct, forceful, assertive, fast paced, etc. - Influence: tends to be outgoing, talkative, trusting, enthusiastic, etc. - Steadiness: tends to be steady, stable, easy going, amiable, etc. - Compliance: tends to be careful, precise, analytical, cautious, etc. In other words, DISC measures how people prefer to act and communicate. The overall preference that individuals have for these four factors is referred to as their behavioural “style.” Most people will have a clear preference for one or two of the four behaviours over the others. In many cases, this natural preference will be formed at a young age and remain relatively stable throughout their lifetime. This information becomes invaluable to know in the workplace. The better team members and leaders understand their personal strengths and weaknesses — coupled with the ability to identify and understand those of others — the better equipped staff will be to develop strategies to meet the demands of the environment. The result will be success on the job, at home, and in society at large. The purpose of the DISC assessment is to empower the individual with self-knowledge and, ultimately, to improve their overall emotional intelligence. In summary, the DISC framework provides a simple, fun and easy-to-remember common language that helps people understand and articulate their own natural preferences, others’ natural preferences, as well as how to best adapt to others in order to be more effective in a range of situations. To find out more about DISC don't hesitate to make contact with MJ at Scope Vision, who as one of our accredited providers will be able to facilitate your DISC assessment.